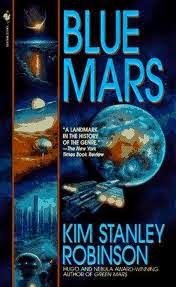 It took me several months, but I finally finished reading Blue Mars (Bantam Books, 1996) by Kim Stanley Robinson, the final book in the Hugo and Nebula Award-winning trilogy that began with Red Mars (1992) and continued with Green Mars (1993). I believe that it is safe to say that KSR has written the definitive speculative fiction work of all time on Martian terraforming, and that he will retain this distinction until humans actually settle on Mars--and perhaps retain it even then, as it is quite likely that his science fiction will become science fact. 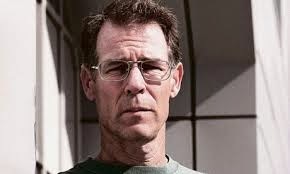 Kim Stanley Robinson (b. 1952) (pictured) holds a Ph.D from the University of California-San Diego. He is a stay-at-home dad and full-time writer. Dr. Robinson is widely recognized as one of the most important and influential living writers of science fiction. Reference to this and additional biographical information may be found here: http://kimstanleyrobinson.info/w/index.php5?title=Kim_Stanley_Robinson. An incredible amount of research must have gone into the writing of Blue Mars, which not only describes the final stages of Martian terraforming in minute detail, but describes in some detail the manner in which the rest of our solar system might be transformed into celestial bodies able to support human life as well--not a single planet or planet-like moon or even large asteroid is left out. KSR's knowledge of biology, biochemistry, geology, areology, vulcanology, meteorology, astronomy, theoretical physics, metallurgy, genetics, philosophy, economics, political science, psychology, ecology, planetology, and just about every other "-ology" is staggering. The book not only works as a scientific treatise on terraforming--it works as a character-driven novel as well, albeit with complicated plot lines. KSR tells the story from the points of view of several diverse and different characters, many of whom were introduced at the beginning of the trilogy and are still around at its end thanks to a plausible longevity treatment. The human message of the novel is one of hope--of what it might be like to be on the cusp of a golden age of art, science, reason, and of understanding the universe and our place in it. Only readers who are geniuses with degrees in multiple disciplines are likely to be able to appreciate KSR's accomplishment completely. My advice to readers is not to allow the complexity of the work to overwhelm--just "go with it" and, perhaps, one day come back to it.